Warminster's large building has been rescued from limbo and now plays host to a number of recognisable brands. First two hours free for all vehicles, after which HGVs, caravans and motorhomes £14. There is no overnight parking available for cars or meal voucher option for HGVs. Prices are paid using PayByPhone - more details. The new mini totem upon entering the service area, showing the brands available on site. With Granada aiming to be running 43 different service stations by 1992, by the late 1980s they needed to do a lot of planning to be seen to achieve this target. This, coupled with a genuine desire to be enterprising and try out a new crowd, saw them open a series of hotel-restaurant sites on A-roads. Being on a single carriageway of only regional importance meant Warminster never quite attracted the traffic levels to justify its large building, and while other Granada sites were packed with High Street names, this has struggled to hold anything other than a Little ChefHistory. The adjacent Burger King has attracted the majority of its custom. It opened with a Granada Country Kitchen Restaurant, Granada Shop, a small arcade area, Granada Lodge and the filling station. In the 1990s, the restaurant became an AJ's, and then when Granada acquired Little Chef and Travelodge the restaurant and hotel were changed again. Granada added the Burger King here. 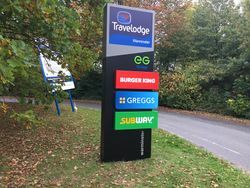 After Granada's encounter with Compass, the Little Chef and Travelodge brands were sold on, but Moto continued to own the site. Little Chef added a Coffee Tempo!, which became Little Chef Express in 2012. 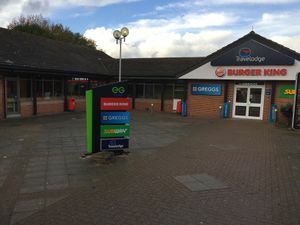 The interior of these services were still full of Granada signage until summer 2016 when Kout (owners of Little Chef at the time) refurbished the amenity building with a slightly old fashioned style. They also changed the Little Chef Express to a Subway unit. The dining facilities are now owned by Euro Garages following the acquisition of Little Chef in early 2017. Moto have parted with Little Chef but operate the petrol station and lease out the motel. During early 2017, Euro Garages planned to open a KFC here to replace the Little Chef. However, these plans were later dropped during summer 2017 as Euro Garages were unable to secure planning permission to install a drive-thru window within the KFC unit. However, in January 2018 the Little Chef was closed and replaced by Euro Garages' own-brand EG Diner following the loss of rights to the Little Chef brand. The EG Diner closed on 12 August 2018 with the Burger King and Subway closing a week later. Refurbishment works then took place with the current amenity building planned to gain a front extension and an extended dining area with the Subway store moving to the former Little Chef/EG Diner area and a new Greggs store replacing the Subway. The majority of these works were complete by late October 2018 with Burger King and Greggs opening as scheduled however the planned extended seating area was scrapped and Subway store opened in December 2018 due to delays in building work. The former entrance to the Burger King is now closed off and this area has been left for a coffee shop to open in 2019.